The editors of Anthropoliteia welcome Stephanie Savell with the latest entry in our forum Security in Brazil: World Cup 2014 and Beyond. Army soldier addresses resident of Complexo do Alemão. Photo: Bruno Itan. 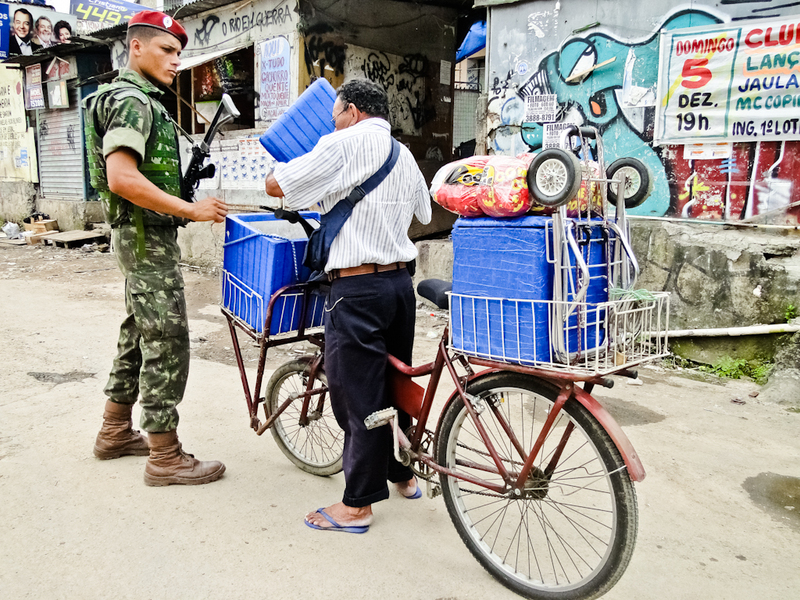 The Brazilian army and marines have in recent years played a more visible role in the provision of public security in Rio de Janeiro. The army currently occupies the sprawling set of informal neighborhoods, or favelas, known as Complexo da Maré, a “temporary solution” timed to accompany World Cup events in the city. The occupation, intended to repress the local control of drug trafficking gangs, will be followed by the installation of more permanent “Police Pacifying Units,” or “UPPs,” as part of Rio’s favela “pacification” program. Between 2011 and 2012, the armed forces similarly occupied the favela Complexo do Alemão, where I lived for a year conducting ethnographic research (2013-2014). Here, based on that research, I examine the significance of the army’s participation in public security.